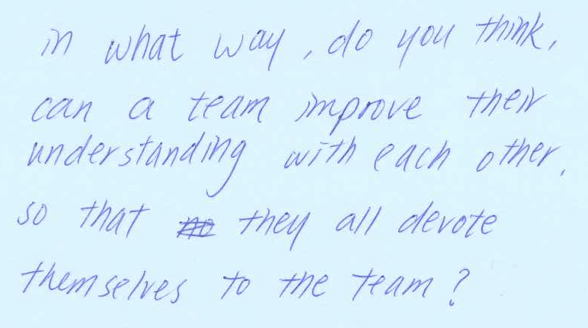 You are making a correct connection between people understanding each other and having a real team. This is an absolute prerequisite before expecting any substantial and sustainable improvement in a team. I interpret your question as what kind of practices do we have in order to achieve this. The most of Agile practices are concerned with creating environment where team members are naturally encouraged to collaborate, get to know and help each other. The most common one is, again, retrospective meetings. Some say, if you are only allowed to choose one Agile practice, let it be retrospective meeting. Why? It is the most important driving force of continuous improvement. To have a such meeting every 2-4 weeks, means to create a moment and place where all team members stop with usual work, take a step back and observe what is happening. This meeting can be facilitated in many different ways. There are many websites and even books describing different techniques or plans. A number of these stimulate teammates to get to know each other better. One that I particularly like is Appreciative Retrospective. There are a number of principles behind Scrum which create environment where people are indirectly encouraged to get to know each other. One of them is that whole team is held accountable for possible failures or successes. There is much less tendency to single out one of the members even if it is obvious she contributed most to a failure or an achievement. Because of this, others in team will naturally appreciate each other or help each other. In general, the best and fastest way for a team to understand each other better, is to simply give them a challenging goal and let them succeed or fail as fast as possible. After a possible failure, they will naturally retrospect and get to know each other in the process. Btw, a team is more likely to learn and get to know each other after a failure than after a successful delivery. Other ways to get to know each other is to have fun together. Have a beer together, diner, organise hackathon nights, watch a movie together, a vacation, play games, BBQ, or karaoke here in Hong Kong :-). This is a short movie of an Agile team that went skiing and snowboarding together in French Alps.